I seem to be on a bit of a trip down memory lane recently! 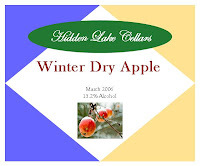 I was perusing my collection tonight and decided to open my last bottle of the second fruit wine I ever made--my 2006 Winter Dry Apple. This wine earned the "Winter" moniker because I started it in March 2006. A couple of months earlier, my first attempt at apple wine ended in a disaster. I was reading Terry Garery's book The Joy of Home Winemaking and followed her recipe for apple wine, choosing a mixture of Granny Smith, Braeburn, and Fuji apples. The only problem was that I chopped the apples into ~1/8 inch pieces and tried to mash further with a potato masher. Didn't work that well. I went ahead with the sugar and pectic enzyme addition, and then added the yeast 24 hours later. Even after fermentation was complete, I still had big chunks of apple left--almost nothing had broken down like I had expected. It smelled pretty bad at the time, but I plunged ahead reasoning that it was just the fermentation aromas. A couple of weeks later after the first racking, it still tasted like rotten apple juice and vinegar. Needless to say, it went down the drain shortly after. To recover from that disaster, I decided to start with apple juice and forgo the fruit mashing. I came across some Santa Cruz Organic Apple Juice at Meijer in Ann Arbor. The bonus was that the juice came in gallon glass jugs, exactly what I needed for making smaller wine batches! Fermentation proceeded smoothly. After it was completed, I split the batch into 2 gallon jugs and added dark toasted French oak chips to one jug (this batch become my Apple Clipper). Three months and two rackings later, I bottled each batch. I bottle aged an additional 3 months and have been very slowly consuming since then. This bottle happens to be my last bottle of the Winter Dry Apple. Appearance: Golden yellow, perhaps a little bit hazy. Taste: Tastes a lot like it smells. Full mouth feel, and smooth finish with just a little tingle on the tongue. Having made this and one other apple wine, I must admit that I'm not huge fan of apple wines--at least those made from Delicious apples. But I learned a lot of technique while making this wine, and it gave me confidence that I could make a decent wine from scratch instead of just the wine kits that I had been making. Since I've moved to one of the cider capitals of the country and birthplace of Johnny Appleseed, I want to get some cider from late harvest apples this fall and try to make a clean, crisp apple wine and see how I like a non-Delicious Apple wine. Seems like I should figure out how to work with the local produce!